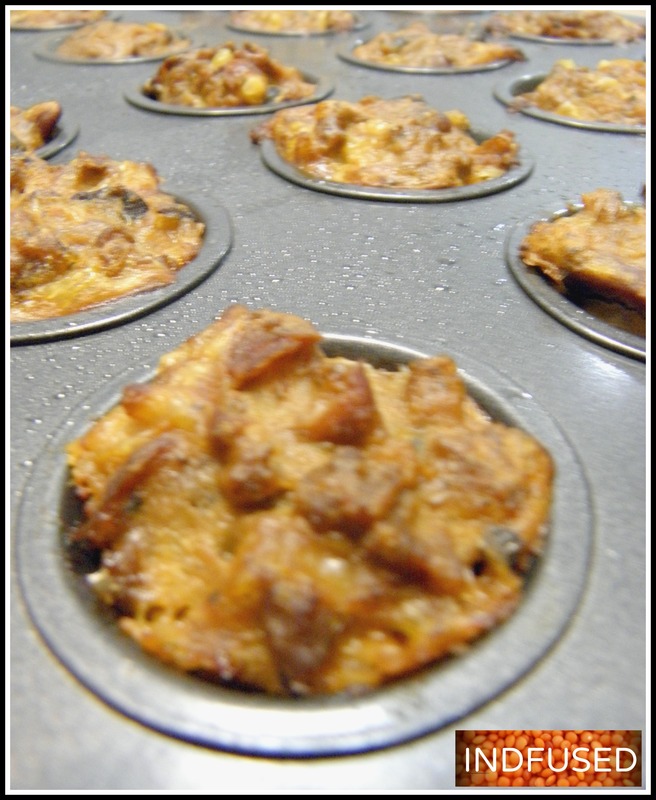 These baked mini appetizers seem to hit the ‘spot’ without compromising on the aroma and taste of the fried stuff. So celebrate TGIF with these mouth watering, mini appetizers that take only 7 minutes to bake and seem to fly off the platters when served! Mini muffin tins are a favorite of mine. They inspire me to make various bite size appetizers and desserts. I made these zesty cocktail bites with my home made chili. I like my food hot, so I topped some muffins with pickled jalapeño slices before baking and dotted the others with Sriracha hot sauce after baking! The cocktail picks look huge in my pictures, but did look nice in real life. I am still learning to photograph the food. My children are my best or worst, but always honest, critics. Combine the chili, egg and the grated cheese. Spoon the mixture in the prepared mini muffin tray. Top with jalapeno, if using and bake in the preheated oven for about 7 minutes or until the egg is cooked and the cheese is melty and ooh so yummy . Remove from tray,dot with Sriracha sauce, if using and serve! Happy Friday! Enjoy the weekend everyone! I just love these bite sized appetizers! Great recipe! Thank you so much Sarah! Happy Holidays to you! Thank you Mira! I enjoy reading your blog. Loved the Haiku! Great idea for a cocktail party! Thank you so much, Liz! I appreciate the kind words. Thank you Ashwini. It is friends like you who inspire me! Thank you Dini! They really taste awesome! Thank you so much for visiting, liking and following my blog! I really appreciate your kind words and am so encouraged to hear them from a talented blogger like yourself. You have an amazing blog too! Looks delicious! Even better is the fact that their baked! Definitely going to try this recipe. Thanks! Thanks Beverly! I appreciate your kind words. So simple! Yet so delectable! Thanks fir posting!